Writer's note: Introducing your new, regularly scheduled, weekly Walt Disney World Resort Update Writer...me, Alan S. Dalinka, no longer just "filling in." Let's get to this week's Update. Actress Carrie Fisher, best known for portraying Princess Leia in the Star Wars movie franchise, passed away on December 27, 2016. The next day, her mother, actress Debbie Reynolds, known for her starring role in Singin' in the Rain, passed away as well. Fans at Disney's Hollywood Studios on January 14, 2017, paid tribute to the passing of Carrie Fisher and Debbie Reynolds by raising lightsabers and umbrellas for a moment as Joy Frost's musical rendition of "Singin' In The Rain Lightly Sprinkled with the Star Wars Theme" played. Video by Alan S. Dalinka. 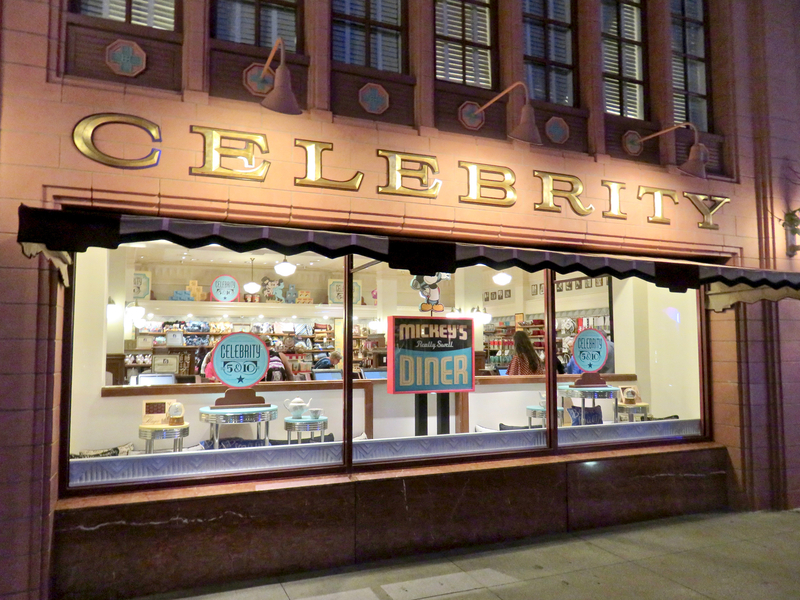 Since Disney's Hollywood Studios is Walt Disney World's center for celebrating all things Star Wars (and is the Florida home of the Star Tours attraction), and since the park's The Great Movie Ride pays tribute to the film Singin' in the Rain, it makes sense that the park would be the site of a tribute to these legendary actresses. Thus, on January 14, in what Disney performer Mark Daniel announced from the Center Stage was a "fan-based event" which was "created for you, by you," fans paid tribute to "a mother and a daughter who forever left their marks on the Silver Screen: Debbie Reynolds and Carrie Fisher." Mark Daniel invited fans to, "either raise your umbrellas or lightsabers toward the sky and, together... pay tribute to Debbie Reynolds and Carrie Fisher." 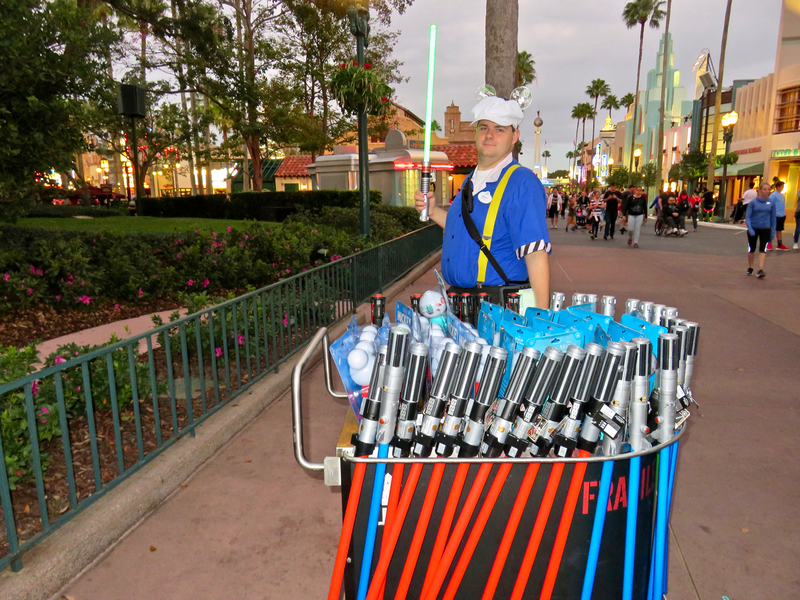 As is also usual on any given day at Disney's Hollywood Studios, lightsabers were available for sale near the center stage as the time for the tribute approached. Photo by Alan S. Dalinka. 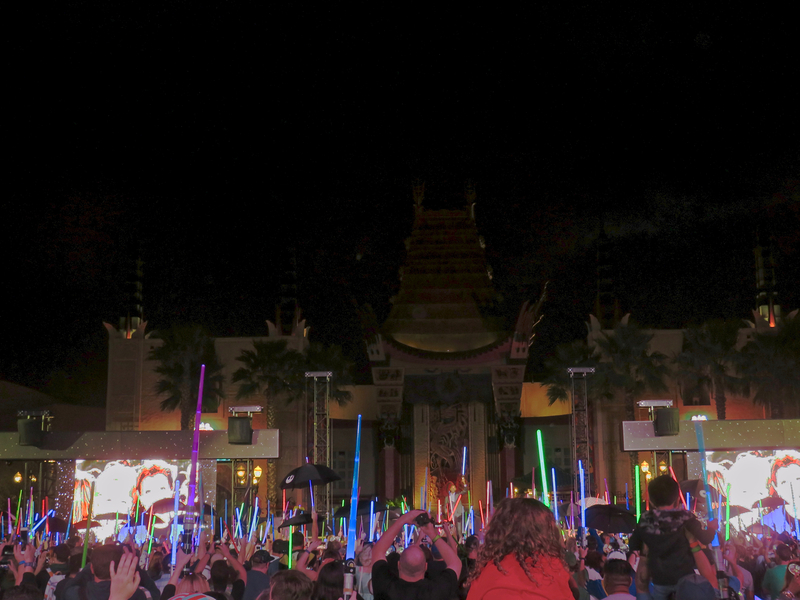 Fans raised lightsabers and umbrellas to honor the lives of Carrie Fisher and Debbie Reynolds at Disney's Hollywood Studios on January 14, 2017. Photo by Alan S. Dalinka. 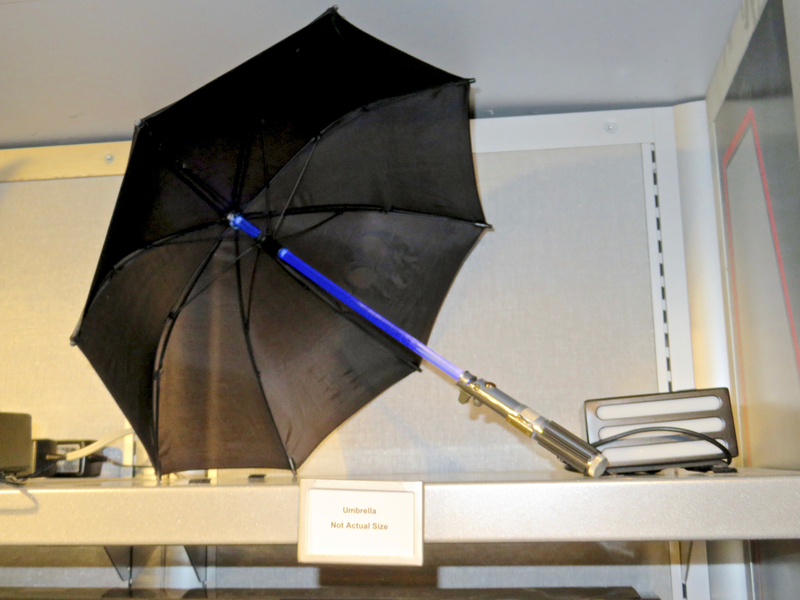 Coincidentally enough, and, as can be seen being raised by some fans in the video of the tribute, the park sells a combination umbrella-lightsaber, as we noted back when the Star Wars Launch Bay opened in December 2015. Photo by Alan S. Dalinka. 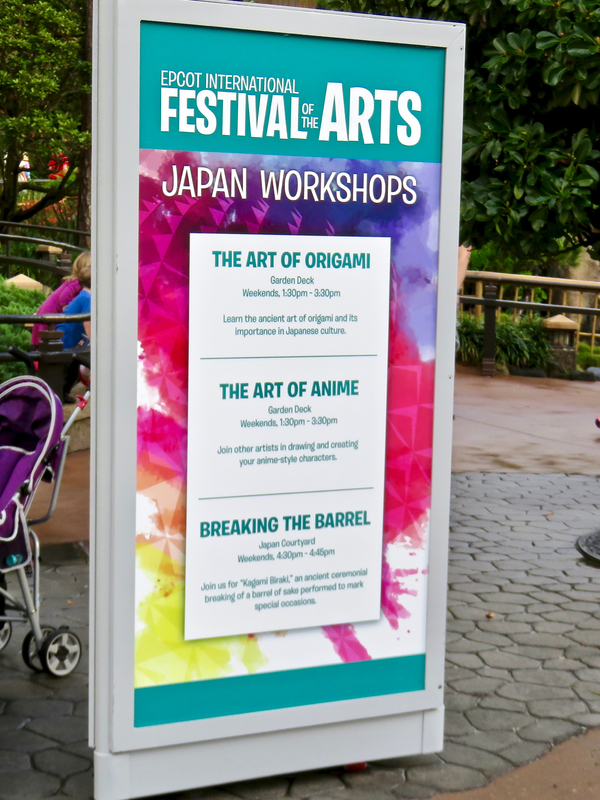 The first-ever Epcot International Festival of the Arts began its six weekends (of Fridays through Mondays) run this past Friday. This new Festival at Epcot celebrates Disney-inspired visual artists, culinary artistic creations by Walt Disney World chefs, and the performing arts, including Disney's Broadway songs and artists. 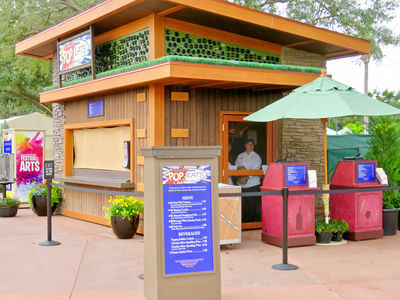 On Festival days beginning at 11 a.m., seven "Food Studios" (six around World Showcase Lagoon plus one in the Odyssey Festival Showplace) provide a theme park-take on "Fine Dining" that really is a step above food served at Epcot's other Festivals (note, though, that a "Fine Dining" experience at a quick-service-style kiosk requires increased waiting time as each dish is prepared for and presented to guests). During Festival days, the Fountain Stage is filled with multiple scheduled performances and, when no performances are scheduled, Living Statues "perform" in the nearby Plaza. Opportunities to step into the art (for fun photo opportunities) are also presented in several locations around the park. 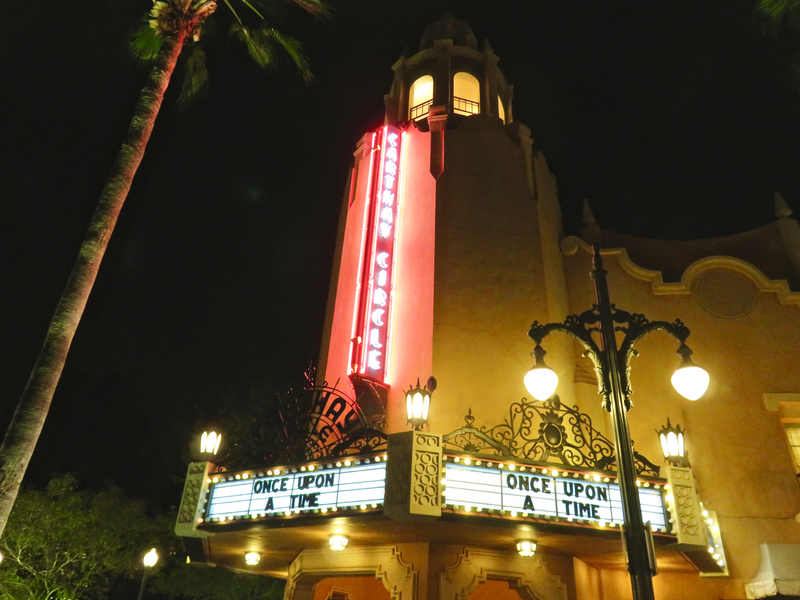 Festival nights include three nightly performances of the new "Disney on Broadway" Concert Series that brings Broadway stars to the America Garden Theatre stage on the World Showcase Promenade performing Disney's Broadway songs accompanied by live musicians. We provided full coverage of what you can find at the Festival, including many photos, video interviews with an artist and several of the Festival organizers, and a video of Broadway stars Ashley Brown (Disney's original Broadway Mary Poppins) and Josh Strickland (Disney's original Broadway Tarzan) performing the song "Supercalifragilisticexpialidocious" in an article published yesterday. The Festival runs through February 20, and is included with park admission (of course, some activities, souvenirs and other merchandise, food and beverages cost extra). Only average mid-January crowds were on hand to greet the Festival's rainy first day, but Saturday saw crowds swell to levels we have seen at other Epcot Festivals on Saturdays and Sundays. Reports suggest that crowds remained large over on Sunday and during the Martin Luther King, Jr. Holiday on Monday as well. 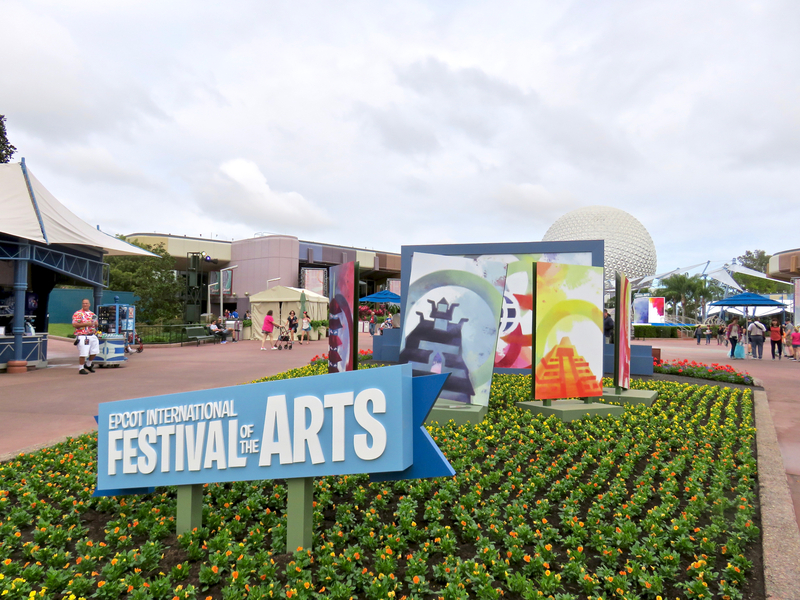 On the opening Friday of the Festival of the Arts, Epcot's parking lot was not any more crowded than usual for mid-January. On Saturday, Preferred Parking sold out by mid-day and the lot was nearly as filled with cars as possible at 5 p.m. (Note that runDisney facilities limit the number of available parking spaces at this time of year.) Photo by Alan S. Dalinka. Future World's flower box near the Fountain Plaza is decorated for the Festival of the Arts. Photo by Alan S. Dalinka. If visiting the park on Tuesdays, Wednesdays and Thursdays (non-Festival days), expect that the merchandise tents around World Showcase will be closed. Photo by Alan S. Dalinka. Food Studios, like Pop Eats, are scheduled to be open at 11 a.m. on Festival days. Photo by Alan S. Dalinka. Food Studios will not be open on non-Festival days. Photo by Alan S. Dalinka. 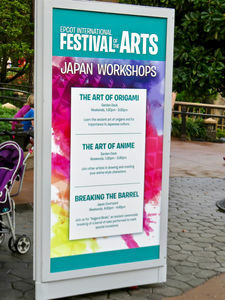 A sign at the Japan pavilion advertises "Quick Study Sessions" that are held there on Saturdays and Sundays during the Festival. Additional Seminars and Workshops are offered at the Odyssey Festival Showplace during the Festival. Photo by Alan S. Dalinka. 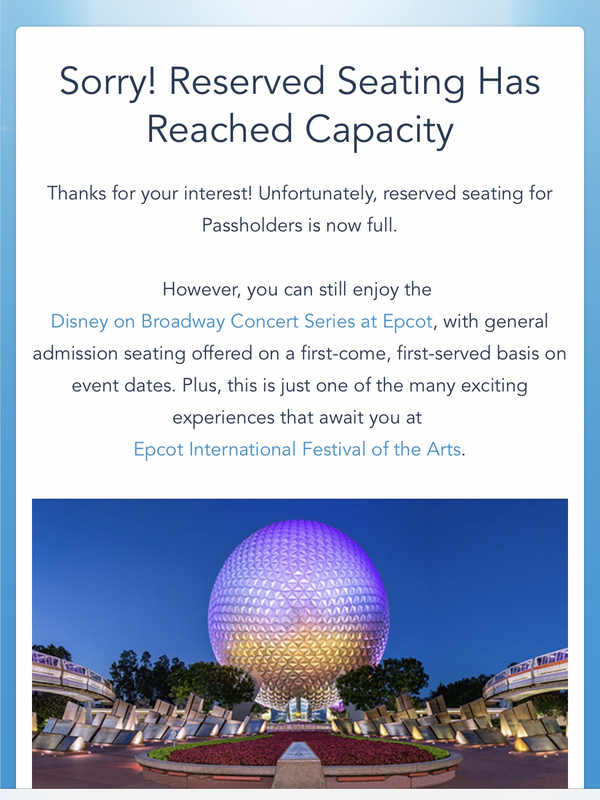 Last week, Passholders received an email inviting them to make reservations for "Disney on Broadway" concert seating, but it rapidly sold out. General seating will be offered on a standby basis. Screenshot of Text and Image ©Disney. 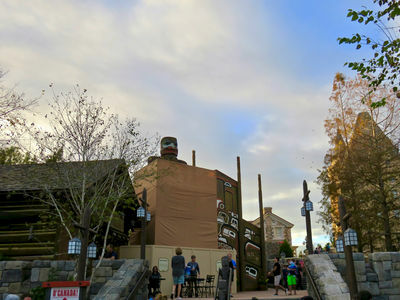 The Rebel Base will serve as the event hub with multiple events, hosted shows, Star Wars dance parties and more taking place in the center of the park. "Inside the Saga: Celebrity Chat Show" – a celebrity chat show in Epic Theater about the making of Star Wars films. Star Wars photo ops – iconic Star Wars backdrops, including Han Solo cast in carbonite, Jabba the Hutt's Palace, the Hoth Wampa Cave and more. Galactic Nights Stars in Cars Motorcade – A procession will welcome in Star Wars celebrities down Hollywood Boulevard. Imperial March & March of the First Order – The arrival of the Dark Side: Darth Vader will lead a battalion of stormtroopers on a march down Hollywood Boulevard to the event stage. Captain Phasma will also lead a unit of First Order stormtroopers through the park, pausing to give a demonstration of power and strength. Seize the Saga Interactive Scavenger Hunt – Collect Star Wars-themed pieces at the photo backdrops throughout the park, revealing a surprise when all items have been collected. "Star Wars: A Galaxy Far, Far Away" – Video clips of the film saga juxtaposed with character moments on stage, featuring Chewbacca, Darth Vader, Kylo Ren and more. "Star Wars: A Galactic Spectacular" – The park's popular Star Wars-themed nighttime spectacular lights up the night. 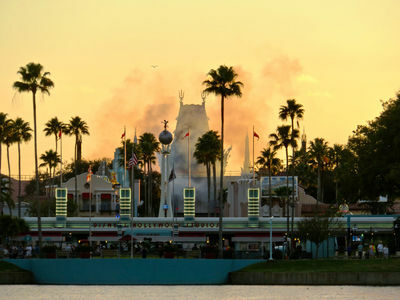 Other popular attractions are also scheduled to remain open, including Star Wars Launch Bay and the Star Tours – The Adventures Continue attraction. 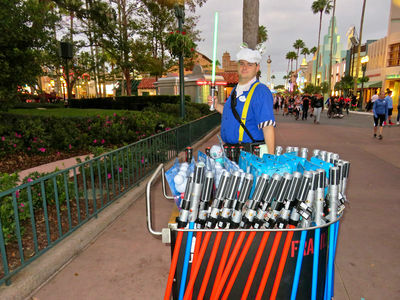 Also expected are AWR Trooper sightings, roaming droids, Star Wars-themed food and beverages, special merchandise and more. The Star Wars: Galactic Nights ticket costs $129 plus tax for adults and $124 plus tax for children ages 9 and under. 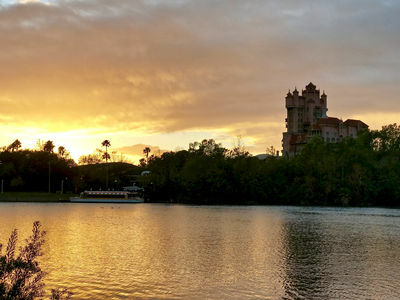 Disney Vacation Club and Passholder discounts are available. Tickets are said to be extremely limited, but, as of Tuesday, January 17, 2017, appear to be available on the Walt Disney World website here. You also may call (407) 827-7036 for more information or to book tickets. Dates are set for this year's "Delicious Disney, A Chef Series" where guests experience evenings filled with delicious cuisine prepared just for you by an award-winning culinarian from Walt Disney World Resort. 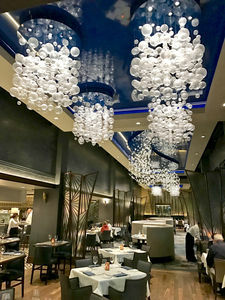 As the Disney Parks Blog announced, "this year, the Walt Disney World Resort chefs launched a new dinner series to showcase the stellar talents of the culinary team; with unique and inspired culinary creations coupled with deliciously creative wine pairings." This year's theme is "storytelling with food." Dinners are often intimate (no more than 60 guests), and the kickoff for 2017 will be Jan. 31 at Cinderella's Royal Table in Magic Kingdom Park. Tickets for the January 31st event are $499/person, including tax and gratuity. 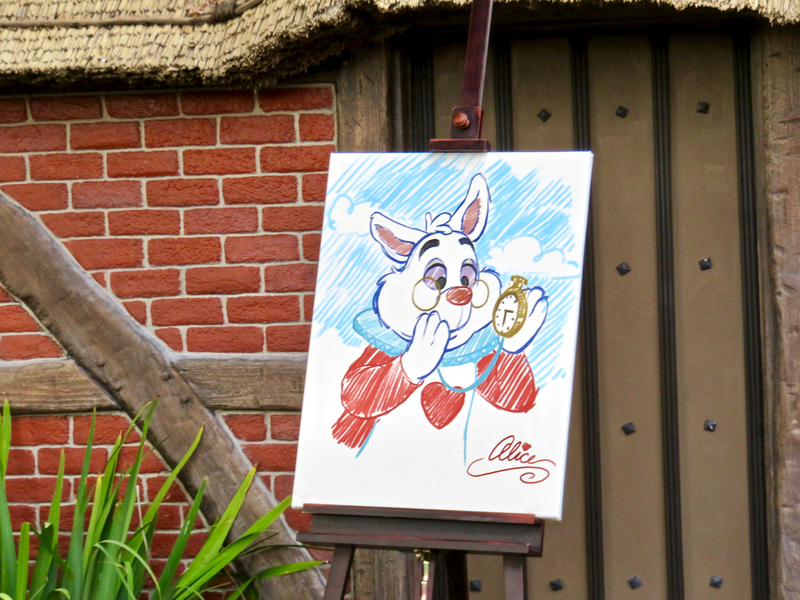 Tables in Wonderland discounts are not available, but members do receive an exclusive gift. The remaining events below range from $199 to $349/person, including tax and gratuity. There will be nine dinners in all, in other locations including Markham's at Golden Oak, Be Our Guest Restaurant in Magic Kingdom Park, and backstage at the Walt Disney World Tree Farm. See the full schedule below. Reservations may be booked by calling (407) 939-5773 daily between 9 a.m. and 5 p.m. Celebrate the Magic Kingdom Parks's 45th Anniversary! April 26 at 6:30 p.m.
June 28 at 6:30 p.m.
July 19 at 6:30 p.m.
August 16 at 6:30 p.m.
September 5 at 8:30 p.m.
December 6 at 6:30 p.m.
*Markham's at Golden Oak Events are hosted by Chef de Cuisine Phillip Ponticelli. I took a few nice walks from Epcot and its International Gateway (the park's "back door") to Disney's Hollywood Studios this week. As usual, I took a few photos that may be of interest along the way, particularly some at sunset and dusk. Refurbishments are underway at the Canada pavilion. Photo by Alan S. Dalinka. 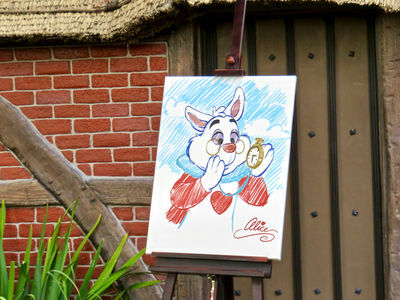 Art added to the "Alice in Wonderland" meet and greet at the United Kingdom pavilion for the Festival of the Arts may be present even when Alice is not. Photo by Alan S. Dalinka. 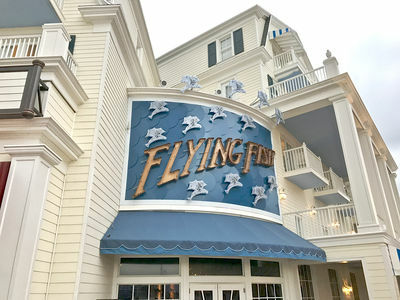 Flying Fish is located at Disney's BoardWalk Resort near the Friendship boat dock. It reopened a few months ago after a lengthy refurbishment, a partial renaming (removal of "Cafe"), and revisions to the menu. Photo by Alan S. Dalinka. 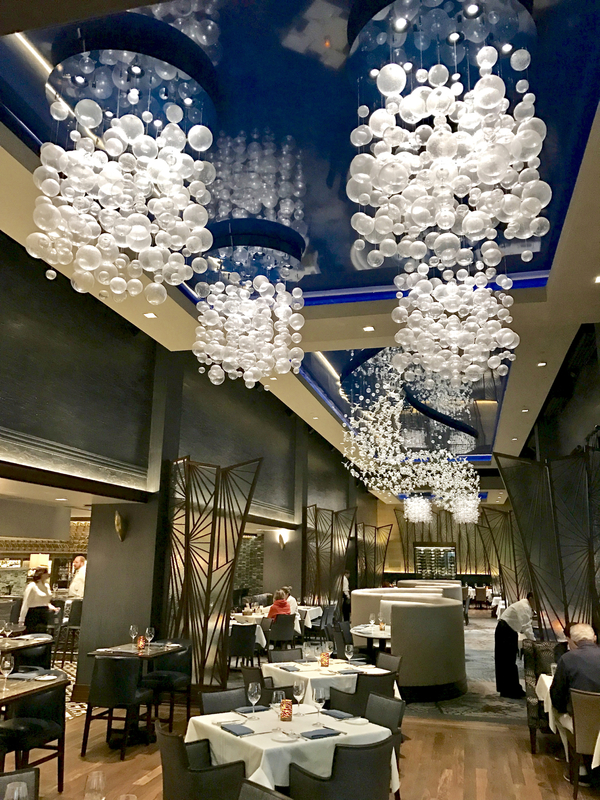 The dining room inside Flying Fish has been extensively refurbished and the view from the connection to the neighboring AbracadaBar is stunning. Photo by Alan S. Dalinka. Approaching Disney's Hollywood Studios on foot from Disney's BoardWalk Resort provides a stunning view of the Tower of Terror standing at the end of Sunset Boulevard. Photo by Alan S. Dalinka. No need for concern here: smoke from the Star Wars: A Galaxy Far, Far Away stage show rises in front of the Chinese Theater. Photo by Alan S. Dalinka. 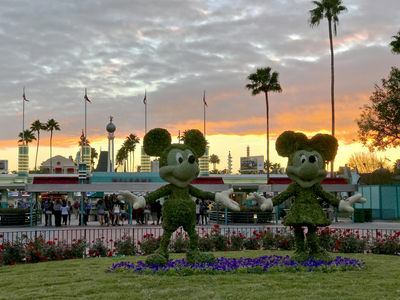 With the Christmas tree recently removed, new topiaries of Mickey and Minnie now greet guests in front of the park. Photo by Alan S. Dalinka. 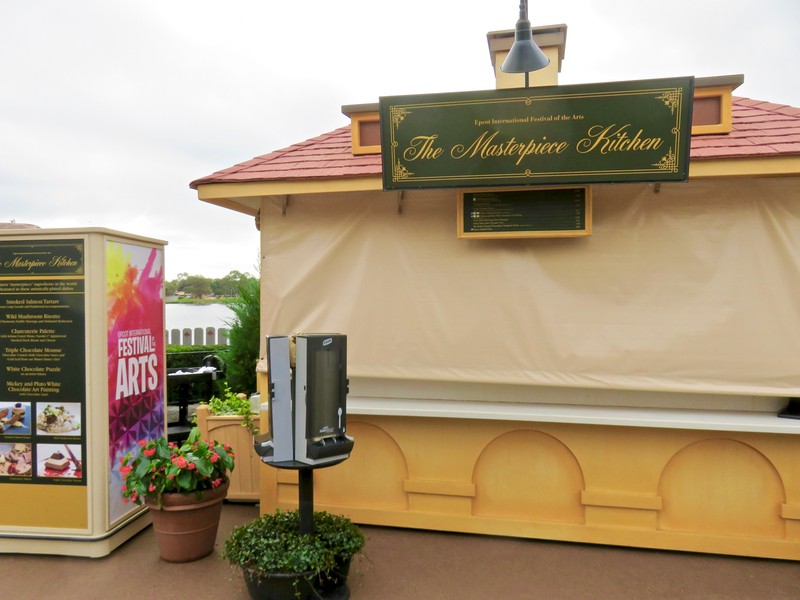 The Carthay Circle Theatre has resumed its regular operation as the Once Upon a Time merchandise shop. Photo by Alan S. Dalinka. Santa Claus and Santa Goofy have left the building. Photo by Alan S. Dalinka. Hollywood Boulevard no longer has any holiday decor. Photo by Alan S. Dalinka. The balloon is updated every four years or so, giving the team the opportunity for a new look. [According to] Matthieu Gobbi, General Manager for Aerophile (the group responsible for operating the balloon), "the new balloon envelope was inspired by the springs and the element of water – it's very coherent, as the balloon floats in the air, then lands on the water of Lake Buena Vista." Indeed, the color palette, with soothing blues and a scrolling pattern that makes me think of gentle ripples in the water, fits seamlessly with the overall aesthetic of Disney Springs. 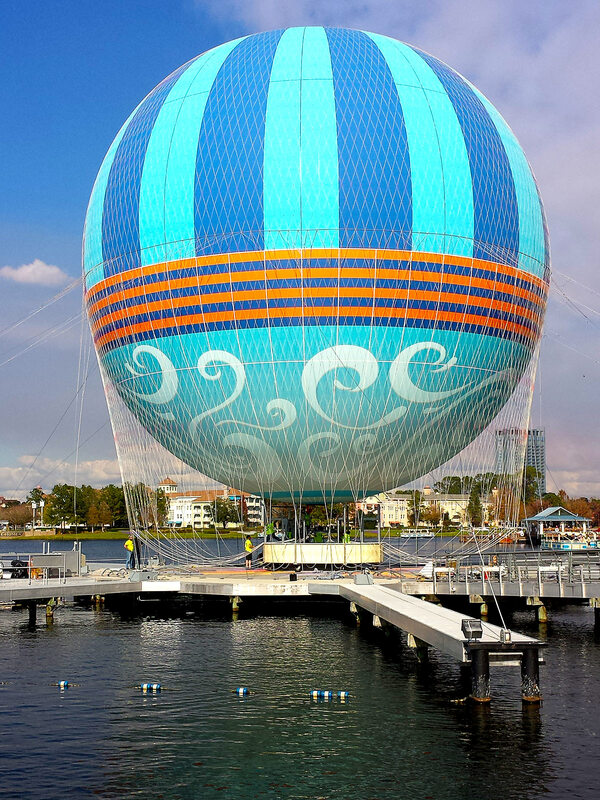 New graphics decorate the Characters in Flight balloon at Disney Springs. Photo by Donald Fink. …Orlando Sentinel reports that Planet Hollywood Observatory finally may be set to open this weekend. We were unable to reach the restaurant's spokespeople to receive confirmation before publishing this Update. Casey's Corner: serving muffins, bagels and a croissant donut, plus savory, "brunch-like" corn dog nuggets and the hash brown dog (literally, a hot dog on a bun topped by hash browns). 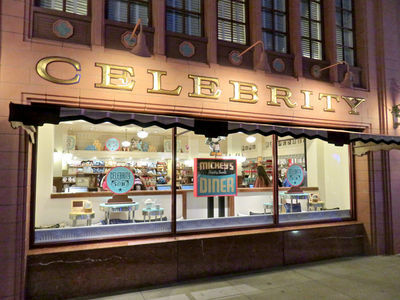 Plaza Ice Cream Parlor: serving Mickey waffles; Kellogg's cereal; and donuts, plus a donut sundae consisting of a donut topped with Edy's ice cream, hot fudge, apple, whipped cream, peanut butter chips, chocolate chips and a cherry. Sleepy Hollow: serving a hot, freshly-made waffle topped with strawberries and whipped cream; plus a new egg, ham, and tomato waffle sandwich (expected later this month), and a fruit and chocolate-hazelnut waffle sandwich. …Earlier this month, twelve new members were officially welcomed to the 2017 Disney Parks Moms Panel. This year's panel boasts an inclusive roster of trusted Disney advisors from all walks of life with unique experience. They hail rom Canada to Brazil and are parents of twins to those with special needs and beyond. 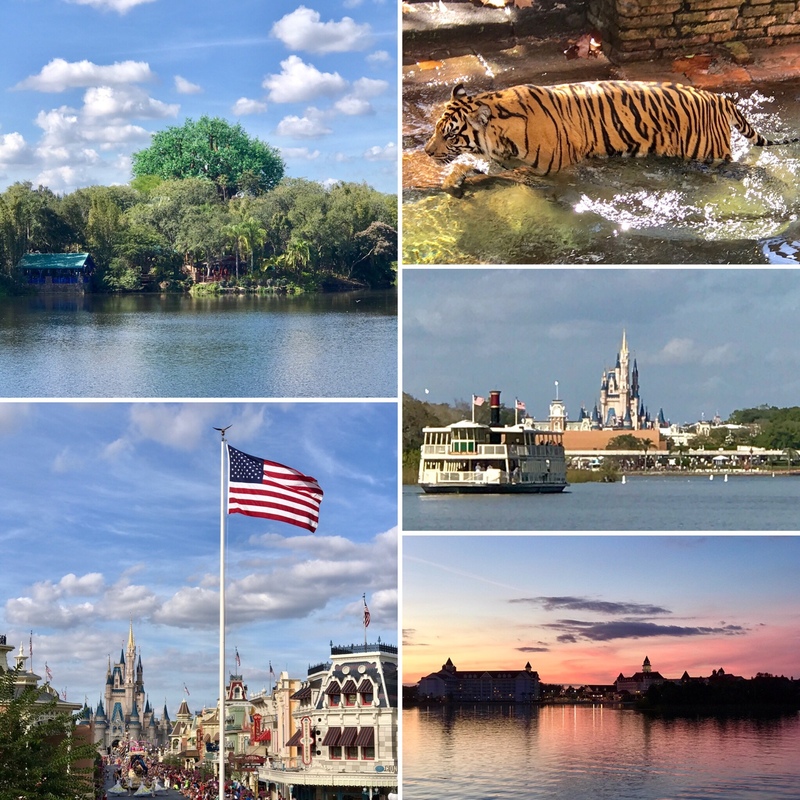 Collectively, these everyday moms and dads join 19 other Disney-savvy travelers to provide guests with personalized recommendations on every Disney vacation escape and answer any imaginable trip-planning question. To meet the new panelists for 2017 and learn more about the Disney Parks Moms Panel, visit their official website. 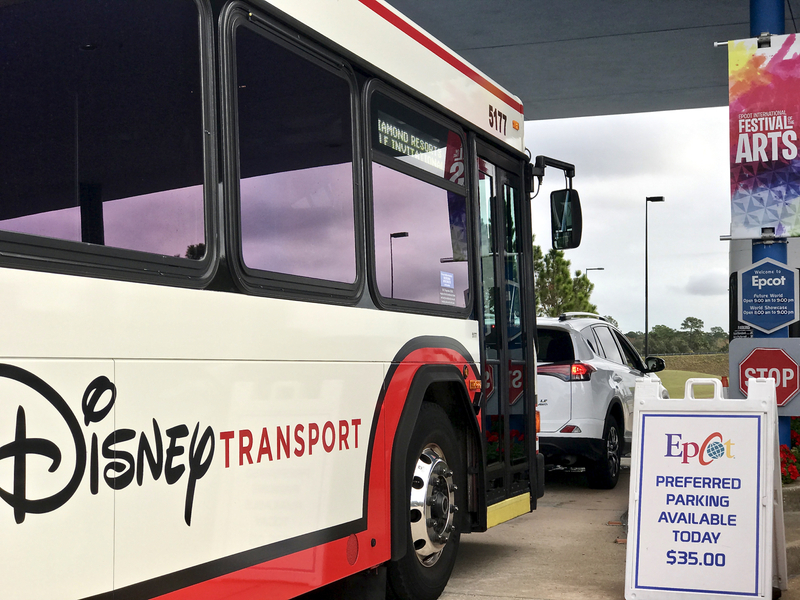 Save time and money at Walt Disney World. TouringPlans.com can help you avoid falling into the typical tourist pitfalls with our per-park Crowd Calendar, Lines - Mobile Wait Times App that gives access to current and estimated wait times for attractions, and Touring Plans detailing the best plan of attack for hitting the attractions. 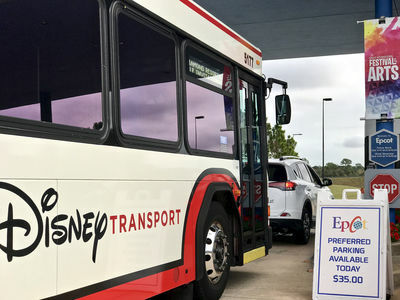 Our trip planning tools show you the least crowded park to visit every day, customized touring plans for visiting Disney's best rides, honest restaurant reviews, how to save on Disney tickets, the best hotel rooms to ask for, and so much more. Get Disney World wait times on your iPhone, Android or smart phone. Check here to see if a park event might fall during your next trip to the Walt Disney World Resort. If you know of any in-park events, official or unofficial, that should be listed here, please send us an e-mail (link). Epcot International Flower & Garden Festival – March 1 - May 29, 2017. Epcot International Food & Wine Festival – August 31 through November 13, 2017. Disney Princess Half Marathon Weekend – February 24–26, 2017. Registration is now open. Proof of time deadline has passed. Star Wars Half Marathon – The Dark Side Weekend – April 20–23, 2017. Registration is now open. Proof of time must be submitted by January 17, 2017. Disney Wine & Dine Half Marathon Weekend – November 2–5, 2017. Registration opens January 17, 2017. Proof of time must be submitted by August 1, 2017. 25th Anniversary Walt Disney World Marathon Weekend – January 3–7, 2018. Registration opens February 14, 2017. Proof of time deadline TBD. 10th Anniversary Disney Princess Half Marathon Weekend – February 22–25, 2017. Registration opens May 2, 2017. Proof of time deadline TBD. Star Wars Half Marathon – The Dark Side Weekend – April 18–22, 2017. Registration opens May 23, 2017. Proof of time deadline TBD. For current information on registration dates and capacity, see Lorree Tachell's runDisney Race Capacity Updates in the Team MousePlanet forum on our MousePad discussion board. Walt Disney World Railroad – closed January 9 – March 2, 2017 for refurbishment. The Magic Behind our Steam Trains guided tour – closed January 9 – March 2, 2017 during the Walt Disney World Railroad refurbishment. The Hall of Presidents – closes January 17, 2017 to add an audio-animatronic figure of the 45th president of the United States. Expected to reopen July, 2017. Sum of All Thrills – closed permanently on September 14. Storm Struck – closed permanently on September 14. Kali River Rapids – closed January 3 – February 13, 2017 for refurbishment. Closed December 24 – March 11, 2017 for seasonal refurbishment. Planet Hollywood – closed for refurbishment and transformation into Planet Hollywood Observatory to reopen soon. Disney Quest – scheduled to close sometime in 2017. Wilderness Lodge and Villas – Hidden Springs pool, resort beach, playground, and Recreation fire pit closed. No opening date provided, but the pool is expected to be closed through 2017. 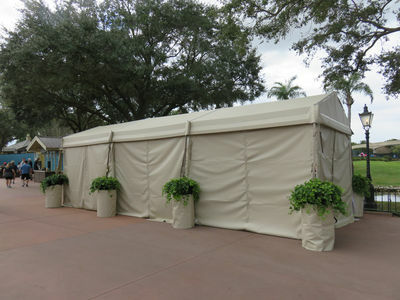 Expect construction-related closures and noise due to construction of the as-yet-unannounced Disney Vacation Club cabins. Disney Osprey Ridge Golf Course – permanently closed. Walt Disney World released several new discount offers for the start of 2017, and Small World Vacations shared the details with us. All of these packages can also be booked through MousePlanet's partner travel agency Get Away Today. Save up to 25% on rooms at select Disney Resort hotels, valid for stays most nights from February 20 through June 10, 2017. Book your stay by March 30, 2017. 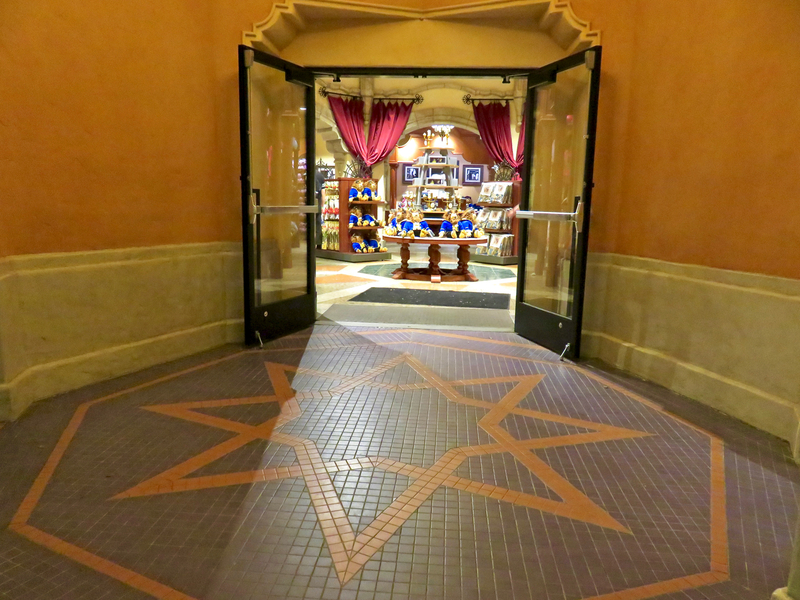 Get a free day added to your ticket when you upgrade to a Magic Your Way package with a minimum 4-day ticket. Offer excludes the following room types: 3-bedroom villas, Disney's Art of Animation Resort - The Little Mermaid Standard Rooms and Bungalows at Disney's Polynesian Villas & Bungalows. Disney's PhotoPass service provides a discount on Disney Memory Maker pre-arrival packages. For $169 plus tax, Walt Disney World guests can digitally download any photos associated with their Memory Maker account, including photos taken on attractions. The advanced purchase price is $149, a $20 savings. Applicable taxes are charged to all orders. Passholders can book rooms at the Disney's All-Star Sports Resort starting at $70 per night under this offer. The discount is valid most Sunday through Thursday nights, January 16 through February 15, 2017. Additional resorts and dates are available for stays through April 8. 2017, with rates from $103 at the All-Star Resorts to $293 per night at Disney's Animal Kingdom Lodge. Offer excludes the following room types: campsites, 3-bedroom villas, Disney's Art of Animation Resort – The Little Mermaid Standard Rooms and Bungalows at Disney's Polynesian Villas & Bungalows. 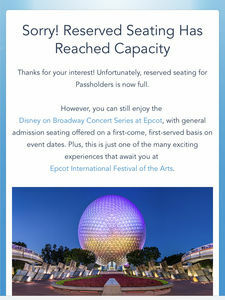 Visit the Annual Passholder website for details, or call 407-939-7676 to book by phone. Present your Disney's Premier Visa Card or Disney Rewards Visa Card for access to a character meet and greet at Star Wars Launch Bay for the cardholder and up to five guests. The event is hosted daily from 11:00 a.m. to 4:00 p.m. inside Star Wars Launch Bay at Disney's Hollywood Studios. You'll receive one free character photo download per day. Walt Disney World Resort tickets may be used January 1 through December 19, 2017, except that the tickets may not be used April 9–23, 2017. The 2017 offer is valid most nights from January 1 through December 19, 2017. Like the ticket offer, the hotel discounts are not valid April 9–23, 2017. None at this time. If you know of an offer we haven't listed, please drop us an email with the details! MousePlanet reader Scott S. alerted us to a new offer for Canadian residents. Canadian residents receive a 25% discount on 4-day or longer tickets purchased by February 28, 2017. The discounted rate for a 4-Day adult base ticket is $244.00 USD, compared to $325.00 USD when purchased at the gate. A 10-day adult base ticket is $300 USD, a savings of $100 from the main gate price. This offer is only good for Canadian citizens with valid passport, or residents of Canada with valid proof of Canadian residency. The tickets are sold as an exchange certificate, and must be exchanged for park ticket upon arrival. There is no expiration date on the unused tickets, but once activated the tickets must be used within 14 days of first entry. You can see the full details on the Walt Disney World website. Thanks Scott for the heads up! Free nights - you can receive up to 4 free nights on a 2 week holiday. These promotions are valid till 29th March 2017. Fantastic photos this week, Alan! Wish I could be there right now to see the Festival of the Arts -- and the smaller crowds. Thanks! Spent a fantastic Wednesday in Animal Kingdom and Magic Kingdom. Here's a preview of photos I may include next week.